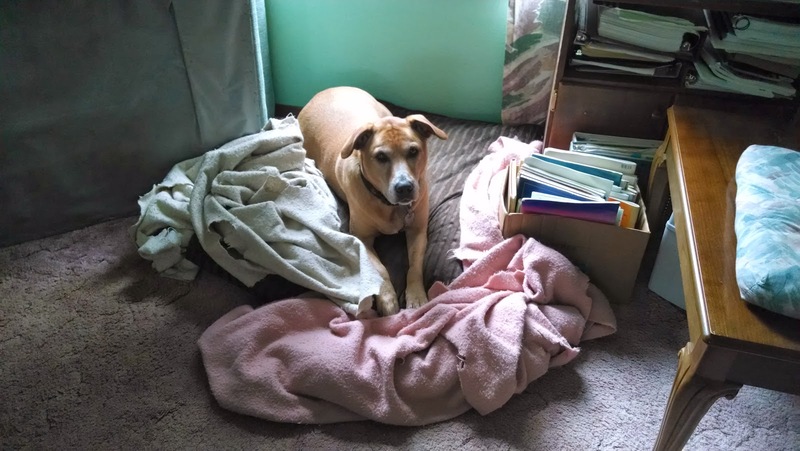 When Annie and her brother Chico were little, less than 20 pounds combined, they shared a little crate in the den, then moved to the laundry room. All the dog-training books recommended crate training, so we did it, and they adapted well. We had our ritual. I would lure them out to the laundry room with Milk-Bones, turn on the Tiffany lamp I placed on the washing machine for a night light, wish them good night and quickly close the door. At first, they whined to come back in, but eventually they would settle down. God help the person who opened that door because they would zoom back into the house and we’d have to do the good-night ritual again. In the morning, I’d open the door and they’d come running, ready for breakfast. When we traveled, I put the crate in the car. It kept the dogs out of trouble, and they seemed to feel safe there. As they grew, I got a bigger crate, which they still shared. But these were not destined to be little dogs. Eventually I bought a second crate. For months, they still slept together, but one morning I discovered Chico had moved next door. 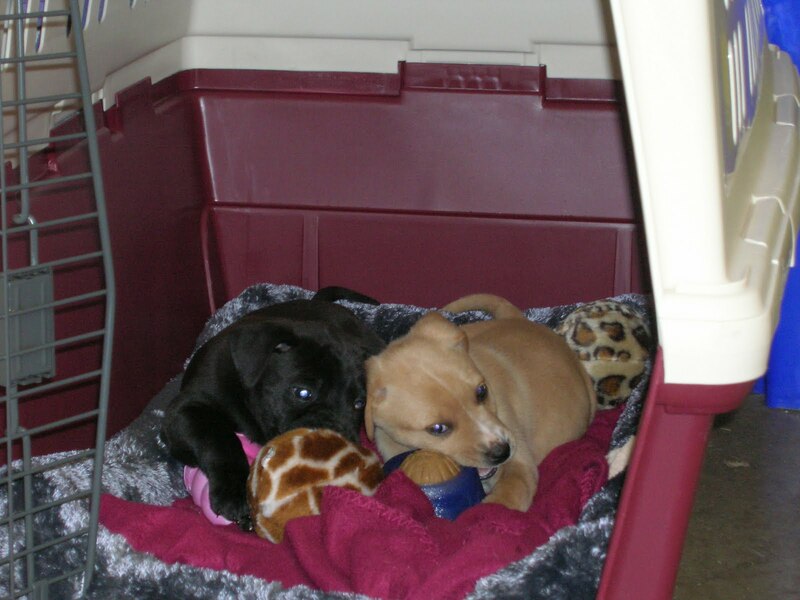 They slept in their side-by-side crates until Chico ran into trouble and I had to give him away. Annie still sleeps in her crate when I’m not home or when she isn’t feeling well. She has a doggie door now, so she can go out whenever she wants–although she usually waits for me to go with her. Over the years, the crate has taken a beating. Annie and Chico were chewers. 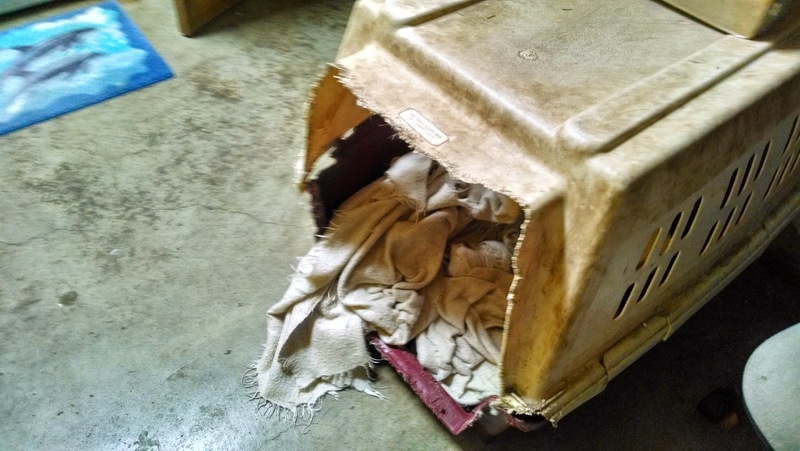 They chewed up the opening of the crate so that the door no longer fits on it. And Annie likes a messy bed. If I put her blankets in neatly folded, she will push them around with her nose until they’re a big ball of wool with the edges sticking out. When I’m home, she now sleeps in the house, either on one of the big chairs or on her pink and white blankets on the floor. The laundry room was a good idea until the temperature dropped below freezing for weeks at a time, and the crate was just too big to bring into the house. The laundry room is only partially finished and gets almost as cold as outside, so I let her sleep inside. We tried sharing my bed, but we kept each other awake, so she sleeps in the living room, and I sleep in my room. But that beat-up crate is still there, just the way she likes it, stinky, messy, dark and private. C is for crate. Where does your dog sleep? 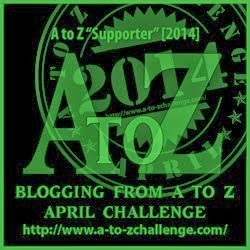 This is Day 3 of the A-Z Blogging Challenge. Each day in April except Sundays we are writing posts corresponding to letters of the alphabet. Because I have several blogs, my alphabet posts will appear in different places on different days. Here’s the schedule. More than 1300 other bloggers have signed up for the challenge. Check out the list at kmdlifeisgood.blogspot.com/p/under-construction.html. You might find some great new blogs to follow. I know I will. Find out what D stands for tomorrow at Writer Aid. I had Mini-Pins that were crate trained. Their brand of crate was the Pet Taxi. So when I wanted them to go to their crate, I would say, “taxi!” It worked great and was amusing to visitors. One of my Mini-Pins was also named Annie. When we had our first corgi, the vet at the time recommended a crate, said to keep him in there when we weren't home, it was safer for him than roaming the house. Worked great so when we got Koda, we just continued on with it. We put him in there when we leave (but we are never gone more than 3-4 hours at a time if it is even that long, I work at home, so he's free to roam during the day when I'm working). He barks for a few minutes, but then settles down and sleeps until we get back. As for where he sleeps at night, he was on our bed but lately he's been on the floor in our room, I think the bed is too hot for him because I haven't taken the winter quilts off yet. An animal lover and a gal who doesn't have pieced ears: You are already my friend! I also applaud you to crate your dog when riding in the car. Too many accidents have been caused by loose dogs (and cats). I will be sure to follow you and Annie – your blog features put a smile on my early-morning face. Thanks, Inge. I look forward to getting to know you. Betty and Ms. Mouse, congrats on your lovable crate-happy dogs. I have three dogs and mine sleeps with me and my sons 2 sleep where ever he sleeps as they will not leave his side. Next Next post: E is for …. Ear!